Gosh, first blog post of the year and I’m all kinds of excited. I don’t know about you, but heading into the new year always motivates me to try and find things I did in 2018 that may not have benefited me, and learn how to clean up those areas of my life, or find things that can help enhance my overall quality of life. Growing up, I ALWAYS loved reading. It was my way to escape and “experience” new places, “meet” new people, learn new perspectives. My love of books grew into a love for words and writing. However, ever since I graduated high school, I have read very few books from start to finish and, honestly, that’s kind of embarrassing to admit. For someone who ALWAYS was reading something, it’s not really a proud moment. As part of my 2019 goals, I’ve decided to give myself that “permission” to read again. It’s my goal to read at least twelve books in 2019 (one book per month) and I’ve decided to share my journey with you here on the blog. As I finish each book, I’d love to share a review of the book about what I learned, how I will use the information moving forward, any other thoughts about the book and where you can grab yourself a copy. In addition to reading in 2019, it’s also my goal to be smart with my money. I know, I know. Money is such a hot topic and no one ever really wants to talk about it. You’re not alone, I REALLY don’t like talking about money with people and feel like those things should be private. However, sometimes we just need to talk about the importance of BEING SMART with our hard-earned money and what that may look like. This post is NOT sponsored. All ideas and opinions are my own genuine and true feelings after reading this book on my own after being introduced to it via a popular podcast. Thank you for supporting my business! 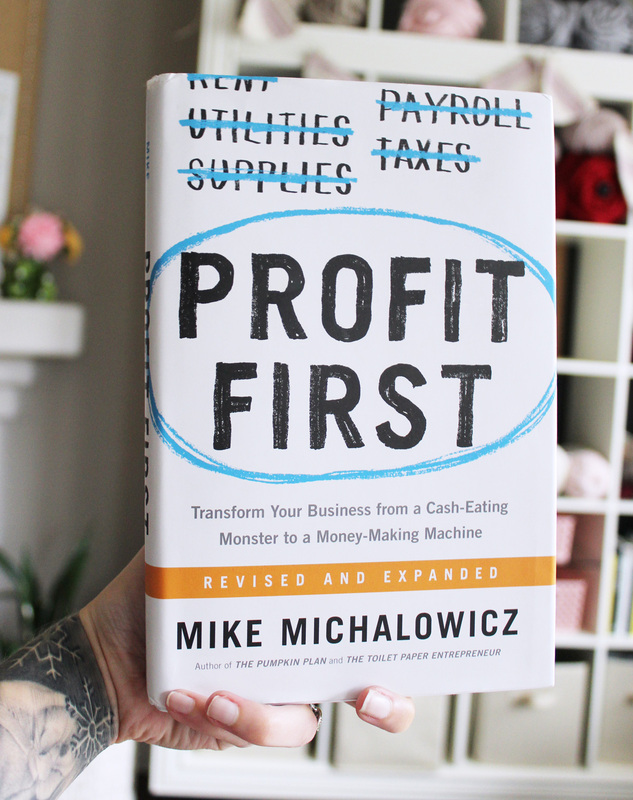 The first book I chose to read for 2019 was Profit First by Mike Michalowicz. I know.. The title of the book may lead you to think that it is focused around greed towards money and keeping all the cash for yourself. No? Well, that was my first impression upon reading the title and slightly made me off-put. However, this book is FAR from teaching how to focus on materialism and hoarding money for the sake of hoarding money. Instead, this book really helped me view money in a new way. A way that truly will benefit my business, my personal finances and, overall, my quality of life. First off, I want to point out that anything I say regarding the details behind the Profit First system are my own personal takeaways and may not be true for the actual structure of the program. Please take everything I say with a grain of salt and be sure to snag your own copy (grab it here on Amazon!) to really understand the full methods. They even have qualified Profit First Professionals who can help you directly with setting up the system for you in a custom way specifically for your business. Those are people you should REALLY pay attention to. Or, just listen to my takeaways, grab a copy and get started on this for yourself! Essentially, the point here is to organize your money by means of separate bank accounts. Like, a minimum of five accounts. When I first read that, my eyes BULGED out of my head and I thought, “YOU WANT ME TO OPEN FIVE DIFFERENT BANK ACCOUNTS?! I’m already overspending in the one I have!” However, this dude is brilliant and it’s so so smart. Each bank account serves a different purpose to PREVENT you from overspending - assuming you’re disciplining yourself to the “rules” of each account. The original setup advises you to open five different accounts (well, really it’s seven.. but I’ll get there) - Income, OPEX (operating expenses), Tax, Profit (profit?! Just wait, I’ll explain) and Owner’s Compensation. He also encourages you to open two other accounts in a new bank that you don’t have easy access to so you can protect the funds set aside for Profit and Tax because you don’t want to give yourself an opportunity to spend those because 1) Tax money isn’t yours to begin with. Like he said, that’s stealing from the government. And 2) you don’t want to touch the Profit funds until the end of each quarter where you pay yourself out 50% of the accumulated funds - quarterly bonus?! Yes please! For the past several years I have basically been managing my finances in probably the least effective way. I’d see money in the account and figure I could “invest” it into the business because that’s how you grow, right? Well, not necessarily I’ve learned. With the Profit First system, you set yourself up for a healthy business by allocating percentages to each account. He has a whole table of specific percentages for different levels of business inside the book and really breaks it all down. But by divvying out the incomes by percentages into each account, it really helps you see it all in a way that makes sense. I can log into my mobile banking app and view all of the accounts and their standings at any given time and not have to worry if I have enough for expenses, taxes, etc. It also helps prevent me from seeing a certain amount in there and assuming I can spend that much and “investing” in something I really didn’t actually have the money for. Going back a few steps, remember when I mentioned a Profit account? Yeah, this is such a cool idea. Basically you can start small, like 1%, and set aside that amount of money into the account each time you run your finances (twice a month according to Mike!) into that account. The Profit account acts as your “emergency” account and can even grow to be a quarterly bonus you can give yourself. At the end of each quarter (every three months), you run your finances as normal as well as look at your Profit account. Hopefully you will have at least a little sum ($20 is a great start!) in the account at the end of the quarter. You then get to pay yourself out 50% of the amount in that specific account as a bonus! SAY WHAT?! I love this idea because it really helps instill an ongoing love for your business. You won’t miss that 1-5%+ from your income and paying yourself a bonus each quarter is always something fun to look forward to and motivate you to grow that account. It’s also super great because in those times where you are in an “uh-oh” moment and have to spend a lot of money unexpectedly, you’d at least have a cushion to help afford (or completely cover!) that cost. SO SMART. Overall, this book was wonderful. I really valued being able learn a new approach to organizing my money for both my business and personal finances. I’m looking forward to the end of this quarter to see how it looks and how I can tweak with my percentages to further grow towards a healthy and thriving business and remove all those stresses about money and spend that mental space doing the things I actually enjoy doing - making and sharing with you! 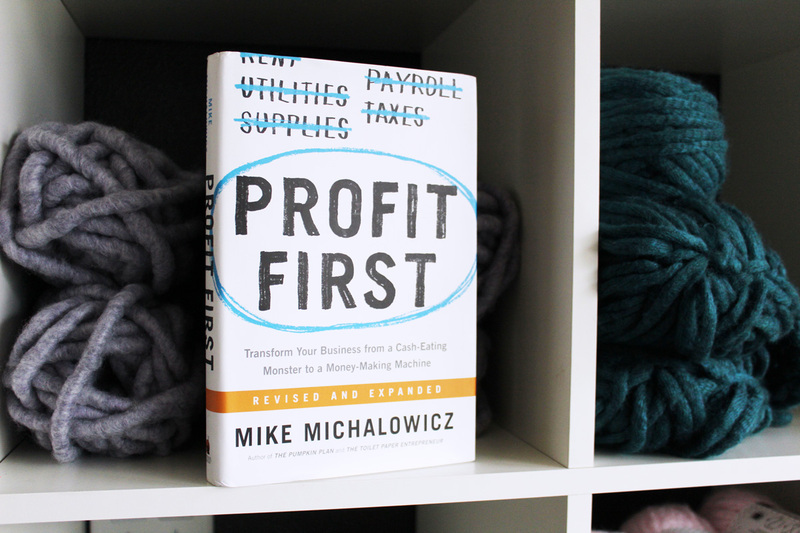 If you would like to get a copy of Profit First by Mike Michalowicz for yourself, you can grab a copy here on Amazon! This post may contain affiliate links. All ideas and opinions are my own genuine and true feelings. Thank you for supporting my business!